Users can now play Minesweeper game on Windows 8 just like other metro style game apps. Windows 8 Mineweeper game application is the successor of classic Windows Minesweeper game. Of course just like other Windows 8 games, Minesweeper also has many enhancements and improvements that will make this legend game more enjoyable for players from all ages. If you want to learn what is new in Minesweeper game on Windows 8, I can list as new modes like Adventure mode, new layouts like Modern theme and Flower Garden theme, daily tasks where you collect coins and medals, successes and prizes you earn when you complete special tasks, etc. If you want to learn how to play Minesweeper and Minesweeper cheats please refer to given tips and tricks page. Windows 8 Minesweeper game app has two themes: modern theme and flower garden theme for kids play. Windows 7 has also the flower garden theme which is an alternative layout with its pretty icons and images especially to make the Windows Minesweeper game more attractive for children. But Windows 8 game Minesweeper metro app has incredible graphics and sound effects that makes Minesweeper game with flower garden layout a perfect entertaining and education game for kids. The default layout which we are used to where we play Minesweeper to identify and mark the squares with mines is now called Modern theme. Of course the graphics are now changed to reflect the aero features of the Windows 8 games, more colorful and more interesting sound effects. Each minesweeper game theme has 3 predefined difficulty level for game players: Beginner with a 9x9 game board layout, Intermediate with 16x16 board layout and Expert with 30x16 squares game board layout. Beginner level (easy) has 10 mines or ladybirds to identify on the board. In Intermediate level (medium), minesweeper game player should successfully mark 40 mines (or ladybirds) to win the game. 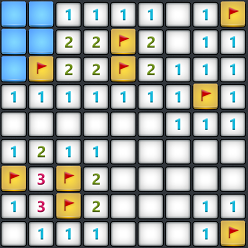 In Expert level (difficult), there are 99 items to flag correctly to win in Minesweeper game. 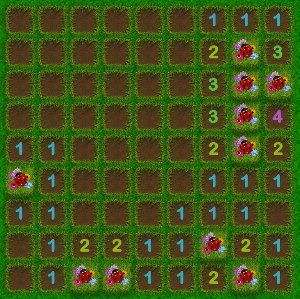 Besides these 3 predefined levels of game, the Windows 8 Minesweeper game app player has the option to customize the game by setting the number of squares on horizontal and vertical dimensions and by setting the number of mines or lady bugs on flowers that will be hidden on the game board. 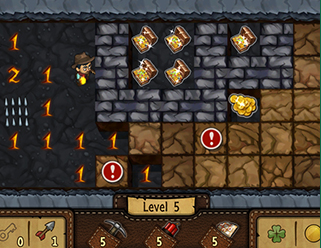 The aim is to collect as much gold as you can in the mines beneath Earth where monsters and traps are waiting for you. The game layout is in different shapes rather than a rectangular or a square game board. And there are some obstacles that the player should eliminate in Minesweeper game Adventure mode. The traps are corresponding to the mines or ladybirds in normal Minesweeper games. And the numbers in empty squares are showing the number of traps that exist around that square. What is now interesting with new Windows 8 Minesweeper game is the achievements you win by completing daily tasks. You can win coins by completing 3 different tasks and win a bronze, silver or gold medal for that month. Another challenge is to win medals that are given to you when you complete the game in specials cases. For example if you complete to mark all mines on the Minesweeper game layout without using flags you win the "Good Memory" medal. Happens to Everybody: If you explode or trigger a mine and if it is your first lose in Windows 8 Minesweeper game, you are granted this achievement(!). Actually you lose in the Minesweeper but you share the honor that everyone has experienced at least once. Welcome to club! Good Start: When you complete your first minesfield successfully you win also the Good Start achievement. Good Memory: When you complete a minefield for the first time without using any flags to mark mines on the game layout, this shows you can keep the places of mines on your mind. So you are granted the Good Memory prize. Click Click Lose: If you explode a mine on your second click on the game board, you are granted this achievement (!). Actually you lose in the Minesweeper game since you are unlucky to find the wrong square at your second try. Savior of the World: If you complete successfully at least one game from 3 difficulty levels in Minesweeper, you are granted Savior of the World achievement. Flag Sea: After you mark your 100th mine correctly in the games, you win this prize. Explorer: When the player successfully unlocks 1000th square on the Minesweeper boards, the player wins the Explorer achievement. Ladybirds Collector: When you mark your first 50 ladybirds on Windows 8 Minesweeper game Flower Garden layout, you win LadyBirds Collector achievement. If the game players want to configure Minesweeper game options like sound effects volume, etc they can use the Windows 8 Settings charm for customizing the game options as they need. To open the Windows 8 Settings charm, you should move the mouse to the bottom left corner of your PC or tablet screen and then choose the Settings for settings charm.